The Santa Maria Valley Chamber of Commerce operates and administers the Santa Barbara County Energy Watch Partnership, and recently the agency once again showed that it is leading by example. The Chamber upgraded its lighting to new, modern LED panels to replace standard 4ft tubes. This upgrade provides cleaner, consistent lighting while at the same time saving energy. Staples Energy, the official PG&E installers for the Energy Watch Partnership, performed the installation. All of the 29 lighting fixtures were replaced with the ultra-thin LED panels in a single day. 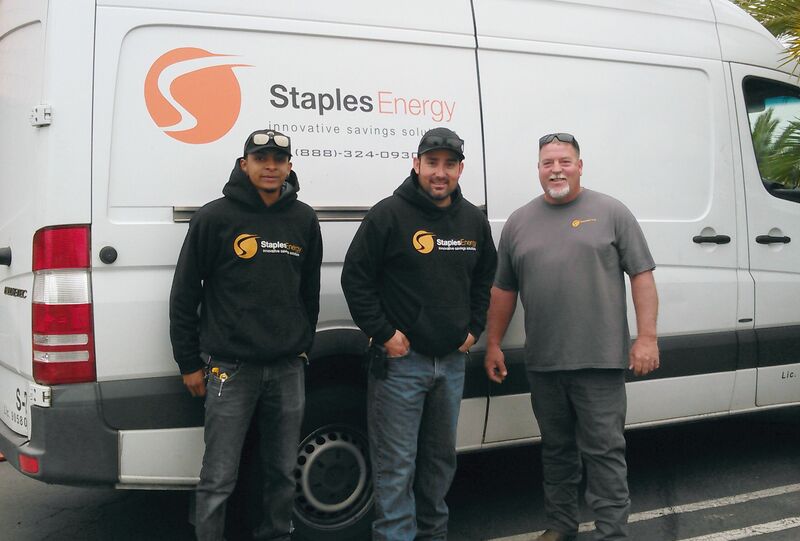 The Staples Energy crew has a reputation for outstanding, efficient work and are able to perform the upgrades with as little disruption as possible. The difference in lighting is compelling. One of the side benefits of the LED panels is a brighter and more visually appealing environment. This has the potential for better performance in the workplace whether it is an office, manufacturing company or service-oriented operation. The Chamber urges all businesses and organizations to become more energy efficient by upgrading their lighting to new, high- tech LED panels, but it doesn’t stop there. The Energy Watch Partnership can provide resources for energy efficiency through both PG&E and SoCalGas. By contacting the Chamber of Commerce, your business can benefit from the program. The Santa Barbara County Energy Watch Partnership has assisted over 400 businesses and agencies in north Santa Barbara County to become energy efficient since 2010. Last year, the successful program was responsible for 1,350,074 Kilowatt Hours saved. That is the equivalent of powering 124 homes. In addition, the Partnership has provided energy efficiency upgrades for all of their municipal partners. This includes the cities of Santa Maria, Solvang, Buellton, Guadalupe and the County of Santa Barbara. In April, the Santa Maria Valley Chamber of Commerce became recertified as a green business through the Green Business Program of Santa Barbara County. To become certified, a business must incorporate sustainability measures that includes recycling, water conservation, and changes in operation that promotes sustainability. The Chamber can connect you with the Green Business Program so that your business or agency can become certified. For an assessment and for additional information about the Santa Barbara County Energy Watch Partnership, contact Dave Cross at dave@santamaria.com .